By Luigina Ciolfi on Saturday, October 5th, 2013 in heritage. 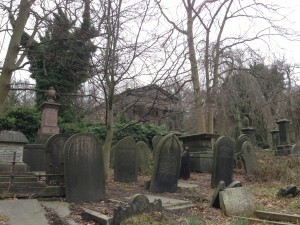 Over the past six months, the meSch team at Sheffield Hallam University has worked with staff and volunteers of the historic Sheffield General Cemetery to discuss and explore novel interaction strategies for visitors of the cemetery by means of the meSch approach of mixing tangible interaction between visitors and the heritage site with digital content. This blog post summarizes what we did so far. The Sheffield General Cemetery is a historic parkland cemetery, which opened in 1836 and closed for burials in 1978. It is now a free and open-access historical, architectural and natural conservation area owned by Sheffield City Council but managed by a community group, the Sheffield General Cemetery Trust, dedicated to maintaining and promoting the site. The meSch team has established a partnership with the Trust that includes a close collaboration with the volunteers who take care of and present this historic space to the public. The Cemetery was landscaped to be the peaceful resting place for people from all walks of life: the site is dotted with funerary monuments, memorials, chapels and a row of semi-interred catacombs. It is also a haven for wildlife and plants. 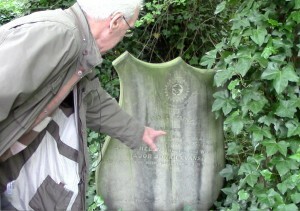 The volunteers offer regular guided tours on several themes, from history to wildlife, as well as providing assistance to people interested in locating a particular grave or memorial. The volunteer tour guides offer their services on a completely voluntary basis and also based on their own knowledge and interests around the Cemetery. In an initial phase of work, the team paid repeated visits to the Cemetery and conducted observations of the site in order to understand its structure, the layout of monuments and of other places of interest, and to gain insights on the number and type of visitors that access the site. Members of the team also took part in a historical guided tour, taking note of the strategies that the guide employs to show the participants around the site, the themes that characterize the narration and the reactions and commentary by the participants. 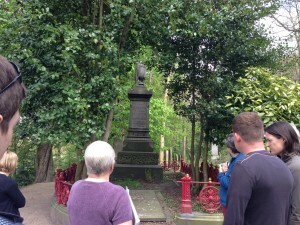 In a second phase of work, the team interviewed eight of the Sheffield General Cemetery Trust volunteers while taking a walk around the Cemetery. The participants were asked to describe their involvement with the Cemetery, their opinions on how the local community and visitors benefit from the site and to show the researchers their favourite places around the Cemetery. Through the interviews, the meSch researchers wanted to understand how the Cemetery is maintained and presented to the public, as well as to learn more about its history and heritage value by the people who know the site best. The meSch team learned many important characteristics of the Cemetery: there are many different motivations for visiting, and that the historical and architectural importance of the site is only one of them. The many regular visitors go to the Cemetery for its peacefulness, to exercise in beautiful surroundings, for relaxation and for informal exploration of the space while walking their dog or breaking the working day with a stroll. As the site is open-access, there are also many passers-by that use the main path crossing the Cemetery as a shortcut between two busy roads and might not have noticed many of the interesting features of the site. Seasonal changes are a very important aspect in shaping the visitor experience of the Cemetery. The landscape changes significantly throughout the year: there is a very strong contrast between the starker landscape during the Winter and the lush vegetation and foliage in the Summer. Moreover, thick vegetation in the Summer makes it more difficult for people to see gravestones and other monuments at a distance, and the lack of artificial lights in the Cemetery means that visiting hours are more limited during the Winter months. There is also a distinct atmosphere between the part of the Cemetery that was cleared of gravestones and the one that retains all the original structures: people entering the Cemetery from the former might not know that the site is indeed a Cemetery, and that there are historic monuments a short distance away. 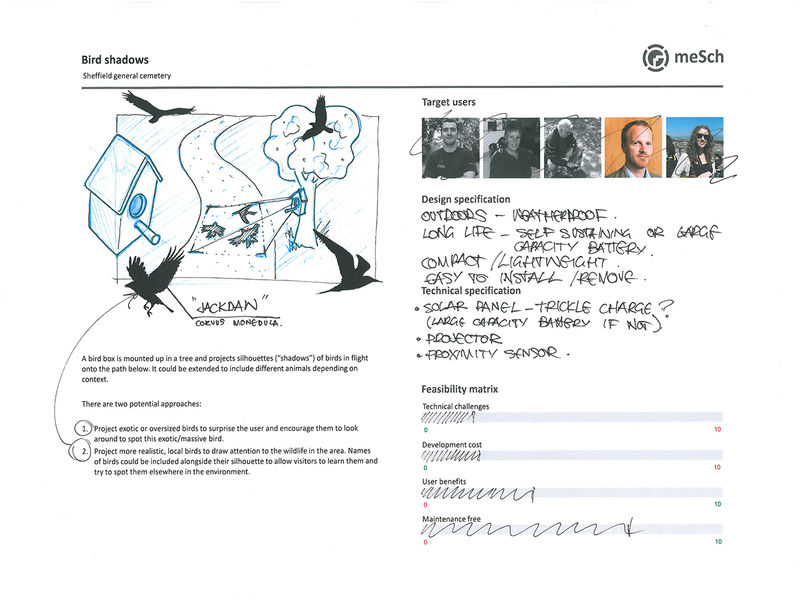 The meSch team initiated creative design activities by running a design brainstorming and producing a number of design concepts for possible installations at the Cemetery. The volunteers participating in the interviews were shown sketches of the design concepts created by the team at the end of each interview, with the idea to inspire the Cemetery volunteers to join in co-design activities and propose novel interaction concepts of their own. The range of ideas covered by the concepts included “portable” artifacts that visitors can take with them during their walk around the Cemetery, as well as standalone installations for particular areas of the site. The concepts were further discussed and developed during a creative workshop that the meSch team organized and that was attended by a group of the Cemetery Trust volunteers. Goals of the workshop were to engage the volunteers in a spirit of co-design, encouraging them to express opinions on our design ideas and to suggest their own; to gather feedback from the volunteers on existing design ideas the research team had generated; and to encourage the volunteers to express their own creative ideas. The Volunteers were invited to discuss the team’s ideas in-depth and to propose their own ideas for tangible interactive artefacts, or modifications and add-ons to the concepts the team had shown them. They were asked to provide their feedback and comments on early prototypes the meSch team had developed and were encouraged to think of possible new features, content and physical characteristics for them. 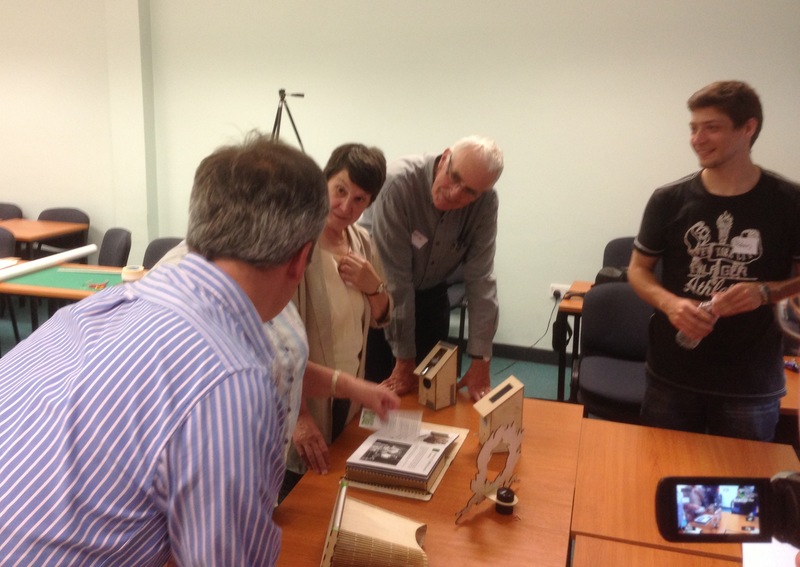 The volunteers were then asked to explain whether and how they thought such designed artefacts could benefit the experience of the Cemetery. Other design constraints were discussed at length: for example how to design technology that would work as effectively in different environmental conditions, how to overcome power issues, bad weather, wear and tear and possible antisocial behaviour. An initial set of prototypes has been developed by the team as an initial attempt to transform design ideas into working installations. The design ideas revolve around three degrees of engagement with the Cemetery: grabbing attention, inviting closer exploration and in-depth engagement. The first prototype idea is meant to grab the attention of the visitor, without demanding too much full interaction and simply hinting that there is more in the Cemetery to be discovered. 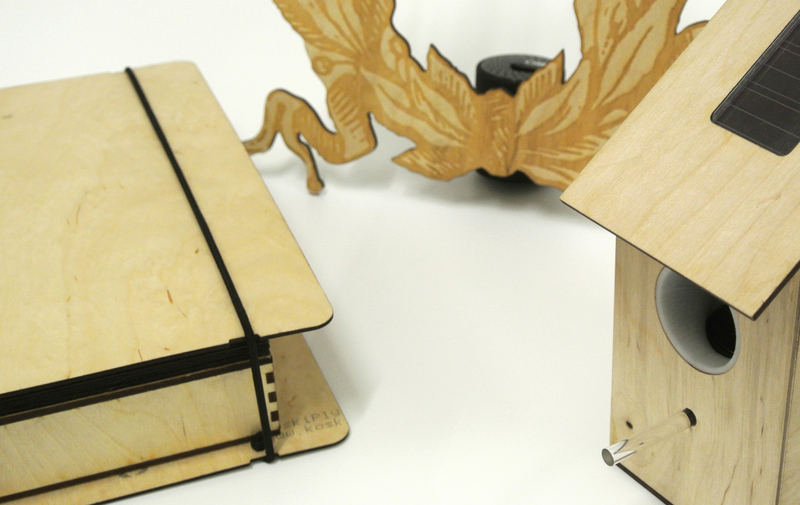 The prototype addressing this is the “Bird Box”: a standalone, solar powered box that projects an animation of birds in flight to attract the visitor attention towards certain paths in the Cemetery. The animation can be regularly updated to reflect the seasons and the birds currently present at the Cemetery. The second idea invites closer exploration, providing relatively simple occasions for interaction. We realized this with the “Binoculars”, a rugged set of binoculars (which can either be hand-held or fixed on the ground) that provide an orientation-based augmented reality visual overlay to particular areas of the Cemetery to aid interpretation. The third idea is focused on those visitors who wish to engage more deeply with the site and are willing to explore more information and to undertake more prolonged interaction during their visit. This is realized by “The Companion Novel”, which the team has developed into a fully working prototype for testing at the General Cemetery. The Companion Novel is an interactive book-like device that visitors carry with them during the visit. By selecting a particular page of the book through a specially designed bookmark, the visitor select a different narrative theme around the Cemetery, and appropriate auditory information on that theme is provided to them by wireless speakers located at specific “hotspots”. By virtue of the distributed audio, the locations themselves invite the visitors to approach them, thus adding a new sensory layer to the site, and avoiding the problem of social isolation that has been found with certain audio guides. 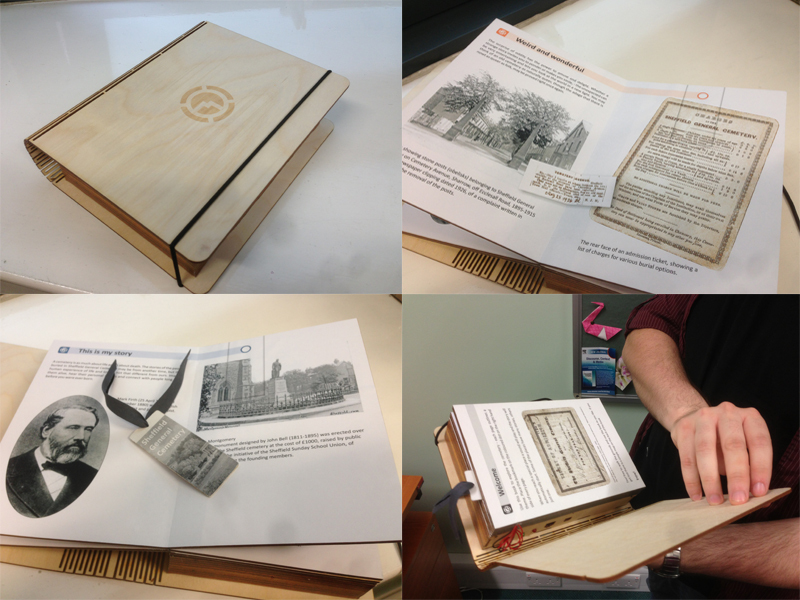 The form factor of the book is meant to support intuitive handling and to fit in with the environment in an unobtrusive way. The interaction that the prototype support is inspired by the lived qualities of the place, from wildlife, to social and landscape history: the Companion Novel is a flexible means for visitors to immerse themselves in different characteristics of the Cemetery. The three themes that the Companion Novel offers are: “Nature in the City”, “This is My Story”, “Weird and Wonderful” and “Favourite Spots”. “Nature in the City” provides insights on the natural richness of the Cemetery; “This is My Story” presents stories about some of the people buried in the Cemetery; “Weird and Wonderful” recounts surprising and amusing anecdotes in the history of the Cemetery; “Favourite Spots” showcases some of the favourite places in the Cemetery as chosen by the Volunteers and past visitors. A short video outlining the interaction with the Companion Novel can be seen here. 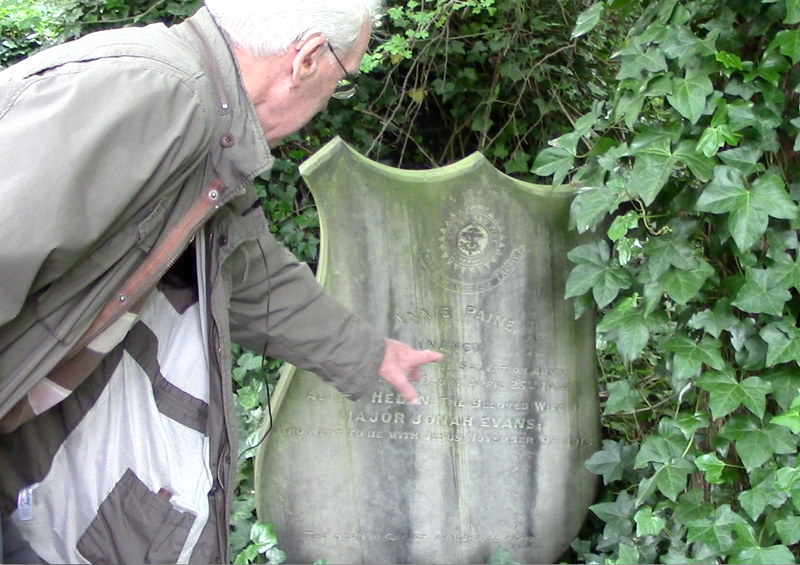 The Companion Novel will be tested with the public on site at the Sheffield General Cemetery in the coming weeks. The meSch team is currently recruiting participants and planning a full evaluation strategy on the basis of previous lab tests of the system and on initial design goals. We are also planning to develop other prototypes, the first of which is based one the “Binoculars” concept mentioned earlier. Others will follow as more design concepts are further specified.